"Of all the souls I have encountered in my travels, his was the most...human." I was already in the process of writing a piece about the recently departed Maurice Hurley when I learned of the passing of Leonard Nimoy. What can be said about the actor that brought Spock to the screen that hasn't been said on every social media platform that exists? 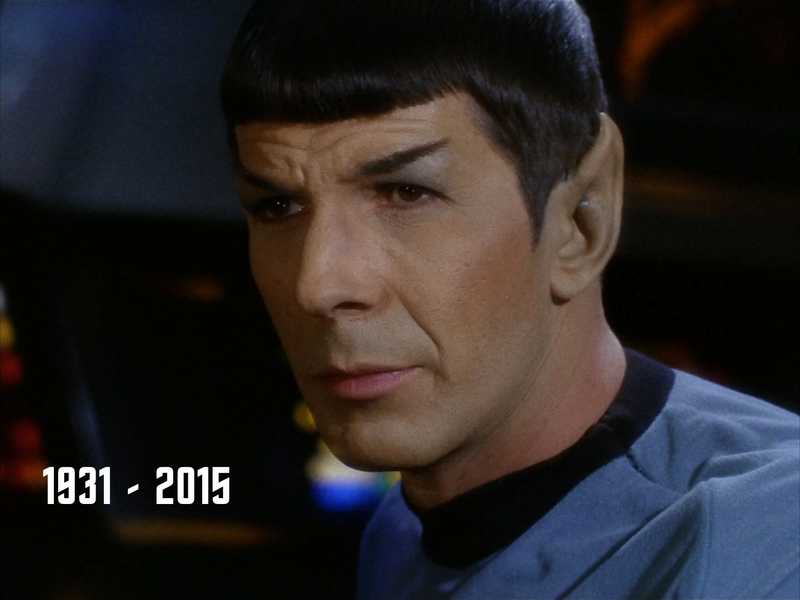 Not much more I suspect but it is a truly sad day for fans of the franchise, potentially the most significant loss since the death of Gene Roddenberry in 1991 - ironically shortly before the airing of Spock's appearance in The Next Generation. I don't want to dwell on his illness or the news we had recently of his deteriorating health and hospitalisation. Instead, I want to talk about what he gave us - what he gave to the fans. For many their first experience and first memory of Star Trek will be from The Original Series and the logical Vulcan first officer. It was a part that boldy stood out in the crew, the only non-human, the mysterious alien, the only character that had been saved from The Cage. Nimoy's portrayal of the character was synonymous with the show and non-fans usually link Spock with Star Trek straight away usually followed by a hand salute and the words Live Long and Prosper. There might even be a mention of the Vulcan Death Grip or a raised eyebrow. The internet has literally been flooded with tributes from the newest of fans through to the most knowledgeable of Trekkies with notable contributions from William Shatner, Larry Nemecek and George Takei to name just three (and barely even scratch the surface). #RIPLeonardNimoy has taken over Twitter and sees no side of abating for some time. 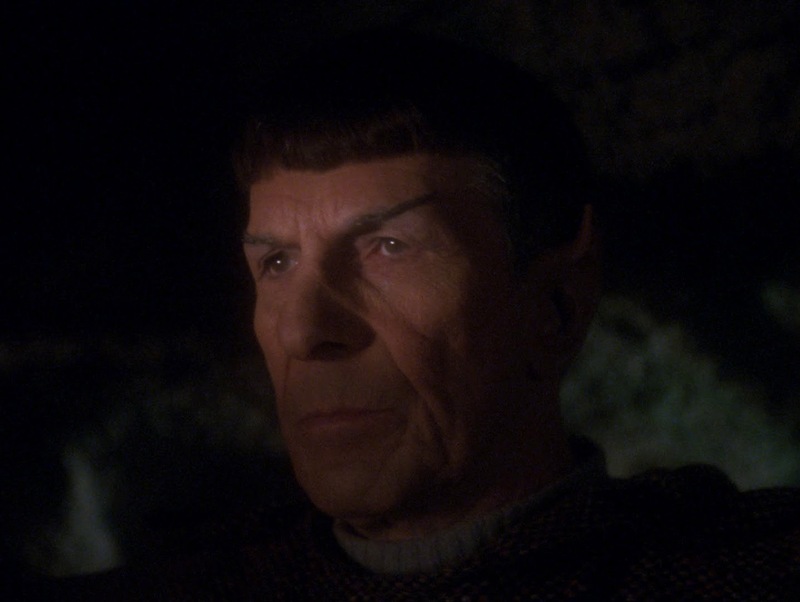 You see, Nimoy created such a recognisable character in Mister Spock that it could be said the franchise exists around him and that powerful, unique performance. It is a truly monumental loss to his family, friends and legions of fans across the globe. I may never have met him but even I feel a little moved by his passing. But I do believe that he would not want us to be sad but look back and appreciate what he gave in his 83 years on this planet. Indeed, it made me think about his greatest moments - the segments of Star Trek that we'll always remember him for. So here they are, Some Kind of Star Trek's tribute to Leonard Nimoy. May you rest in peace and thank you. Star Trek would not have been the same without you. I had trouble singling out one moment in this episode. It is the ultimate Spock episode, encompassing his culture, the clash with his role as a Starfleet officer vs the demands of his home world as well as one of the most brilliantly shot fight sequences in the show's three seasons. The closing scene where Spock's joy at discovering Kirk is not dead is awesome to see and solidifies the Kirk/Spock relationship. Nimoy was at his best here, even when letting that guarded emotionless front slip for a moment. "I never took the Kobayashi Maru test...what do you think...to my solution...?" How many times have I watched this movie and every time this still resonates as much as the first. The movie is 33 years old yet Spock's sacrifice to save the Enterprise is perfectly logical given the needs of the many which echoes through the story. At the time no-one really knew if Nimoy would return or if there would be a Star Trek III but killing off such a high profile character was unprecedented but so effective. It's one of the factors which makes The Wrath of Khan the ultimate Star Trek movie and I think it's Nimoy's ultimate Spock performance. "And Captain Picard, you have found him..."
The second part of Unification might have the long-awaited Spock and Data chat but Part I left viewers hanging from the pre-titles sequence right to the final moments to see Ambassador Spock outside of a grainy screen image. 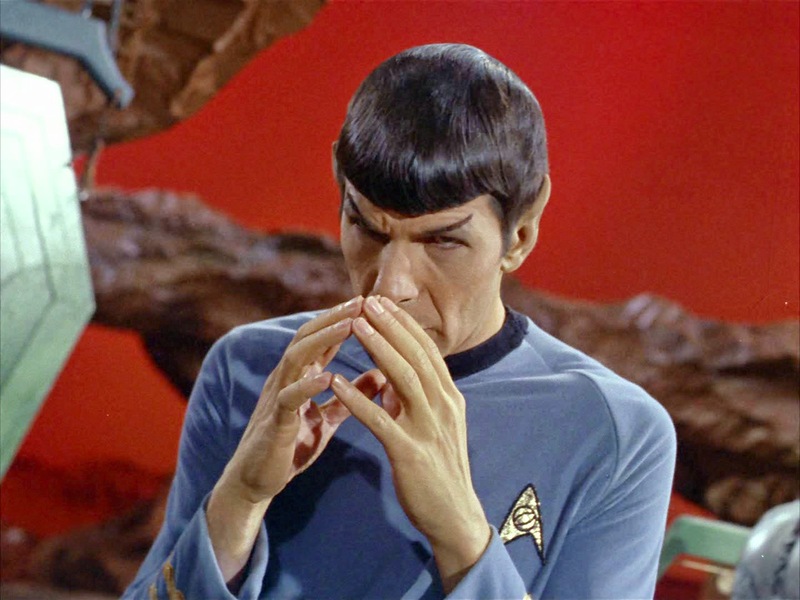 I know of a couple of Star Trek fan friends who have admitted they fan-boyed out when Nimoy stepped out of the shadows. We'd had McCoy in the pilot, Sarek in season three but this was 25 years and the return of Star Trek's most famous character. You could ask for no more and this closing scene delivered a stunning cliffhanger which also interwove elements of The Undiscovered Country. 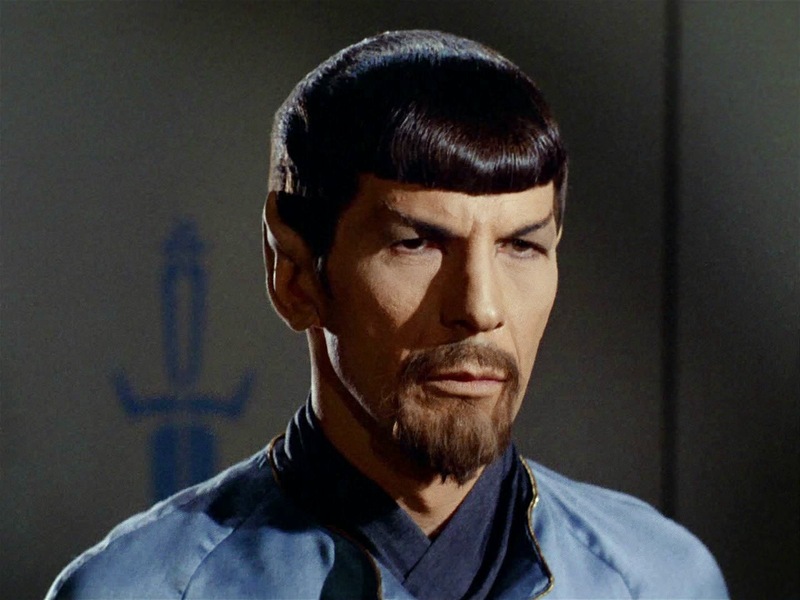 Whoever thought that sticking a goatee on Spock would influence generations of writers? The trim beard would become eternally linked to evil versions of characters across countless TV series. Nimoy portrayed this Spock just as logically as his Prime Universe original but with an ever so slight colder edge and very understated. Mirror Spock is perhaps nearly as famous as the non-facial-hair-wearing Enterprise first officer but we only got the chance to see him once. 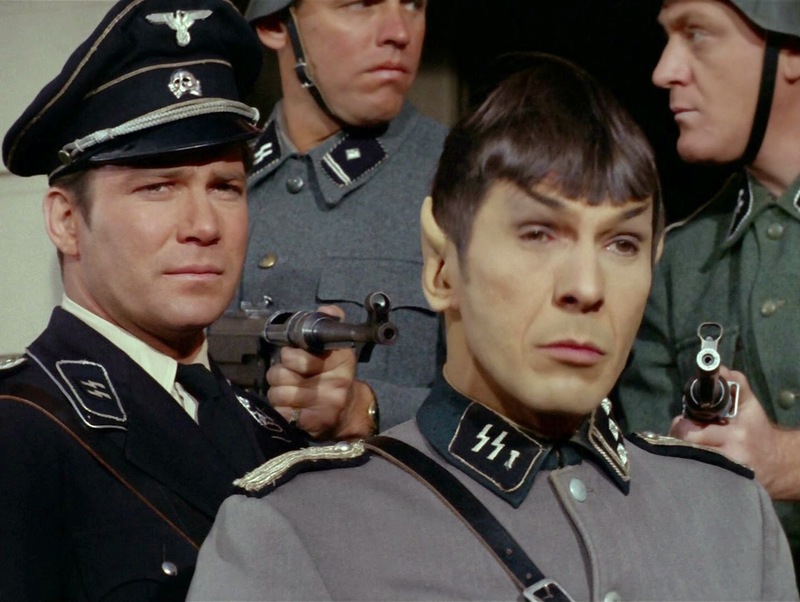 The reboot might have narked off legions of fans but it did have one key and perhaps redeeming feature - Nimoy was able to return to his role once twice more. While his appearance in Into Darkness was fleeting and perhaps unnecessary, his story in the 2009 movie did feel as though Abrams was attempting to join the two universe together while stepping out on a brand new journey. Nimoy may have been in his late 70's when he filmed his scenes but he had lost none of of his appeal and was every bit of Spock he had ever been. The tragedy is that we will now be unable to see the suggested onscreen Shatner/Nimoy reunion that was rumoured for Star Trek 3. That's just five great Spock moments but there are a whole lot more - his use of expletives in Star Trek IV, melding with the Horta in The Devil in the Dark, meeting his parents in Journey to Babel; denying he and McCoy had seen Kirk's final orders in The Tholian Web; it's a big list and one we could spend many a day attempting to exhaust and more than likely couldn't. In fact I have edited this post the morning after writing it and still don't think I've said enough. His passing leaves a big hole in the franchise especially with the 50th anniversary just a year away. A very sad time and our thoughts are with those he leaves behind. A great actor, the definitive Vulcan, a true icon of the Star Trek universe without whom it may not have become the phenomenon we have come to adore today. 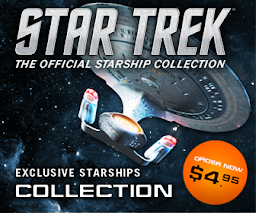 It seems like an age since we had the Enterprise-B as our header image - in fact it's over a year but her arrival in the Starships Collection was one we were counting down to since it was announced. 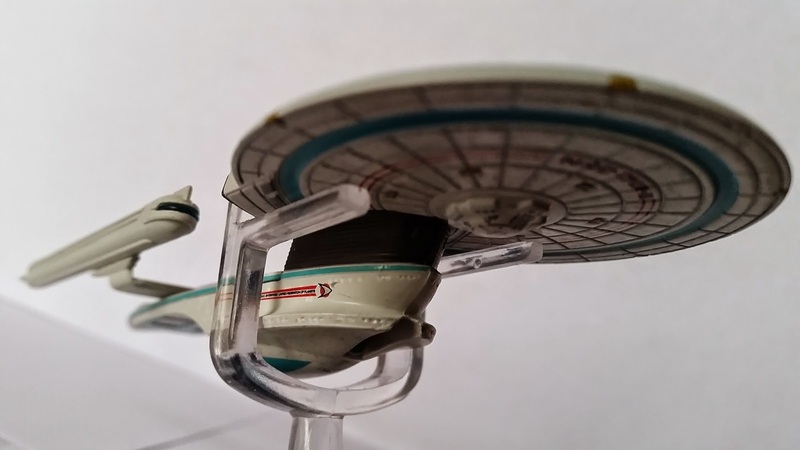 Fans were skeptical that this would be a reworking of the Issue 7 USS Excelsior model and while it is the same size and scale as the class ship, it's more than that. Finely detailed she only managed 15 minutes on screen but Eaglemoss have recreated her perfectly. 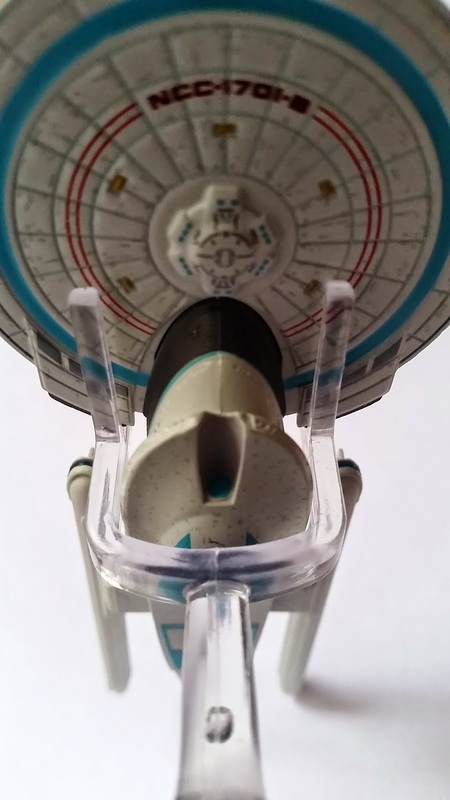 The metallic saucer section carriers all the hallmarks of the Excelsior Class in the blue/grey detail around the bridge plus the two additional impulse engines that upgraded her to the "B". The secondary hull itself is a fresh mould and those flying-boat curves aren't just stuck on pieces which does place a point firmly to Eaglemoss who have pulled out all the stops to make this very individual - their next big challenge could be making the "A" better than the below par movie refit. The lines and overall shape might well be a replica of the Excelsior which means that, like the Sovereign Class it suffers from the size constrictions of the range. It would certainly have benefitted from a larger realisation especially to highlight the paint job on the saucer. She's also a little front heavy thanks to that metallic saucer although the detail of the maneuvering thrusters and segment lines is very, very impressive. Those engines are just as plastic and flimsy as you'll remember from the Excelsior but they do get the upgrade treatment with all the fins and flicks you would expect as well as the reduced nacelle "blues" along the sides but if you compare to the magazine plan view you'll spot that the sides of the nacelles should be a grey colour. Also the ship registry is only featured on the inside edge of the engines not the outside as you might expect. Double points mind, for the fact the engines are parallel to each other and square against the secondary hull. The plastic sections don't have the panelling detail that we see (written that line a few times) that exists on the saucer but the positive is that the paintwork is less lumpy and bumpy and certainly a degree smoother. 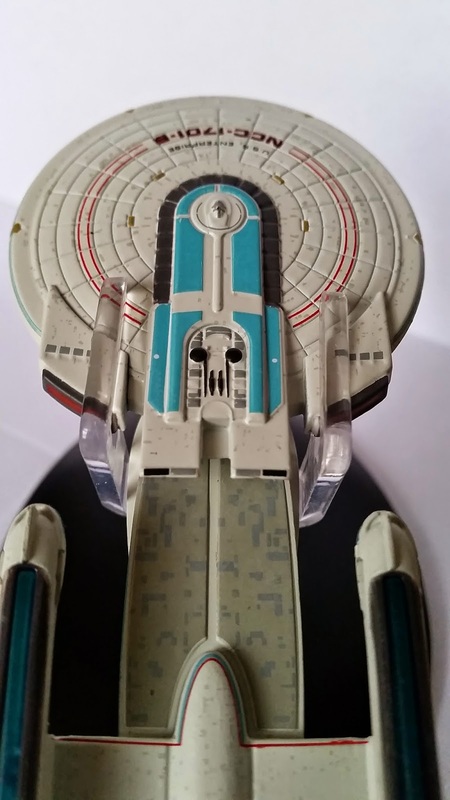 Across the primary and secondary hull there is a peppering of darker grey denoting the hull plating which, along with all the other modifications shows that this is a much more comprehensive a model than Eaglemoss produced with the Excelsior. That's not to say that it wasn't a great ship but the Enterprise-B shows a much more meticulous attention to detail and through that the suggestion that the producers of these ships are taking note of what the fans want to see and are expecting from the ships. Where you might expect some form of gap, especially around the rear shuttlebay and in the open section that should sit in the underside of the secondary hull they are both filled in and while not totally accurate, it is a restriction of the format and entirely forgivable; nitpick over. From my perspective this is a brilliant model and one I'm considering dropping onto my desk at work for a few weeks. It also means that I'm anticipating the upcoming Enterprise-C even more as the quality just keeps on getting better. The magazine is a little bit of a disappointment to be honest. It has to be the ship with the least screen time covered up to this point. Effectively the coverage of the "B" has to be a step by step retelling of the opening sequence from Star Trek: Generations which was one of the best bits of that movie. Alongside that minimal exposure the magazine has to rely on images of the Excelsior from The Undiscovered Country to fill out the content. Donating a double spread to the Master Systems Display is certainly different but being followed by the obligatory plan views means you have four pages covering roughly the same material. The section dedicated to the design of the modified Excelsior Class ship is a great insight into how it had to remain familiar yet at the same time provide something new and exciting for the seventh Star Trek movie. As always this section has some wonderful images from the design process and shots of the model but the lack of material in this issue does show through in that Eaglemoss have filled the remaining pages with a piece on crashing the Enterprise-D saucer from later in Generations. The Klingon Raptor keeps up this month's "one-off" theme. It probably had about the same amount of screen time as the Enterprise-B in the first season Enterprise episode Sleeping Dogs. The first new Klingon design since the Negh'Var/future Klingon ship of All Good Things, it evokes all the features of a Klingon ship - the long neck, the upswept wings, the rear engine pod, green; it's all there. The Raptor model is almost completely metal and very well detailed. It's a lot more precise in its finishing quality than the Enterprise-B as the final paint job appears a lot cleaner than the white on the saucer of the Federation starship. The metalwork is excellent, clean and precise with increased detail on the raised cabling which is very reminiscent of the Bird-of-Prey design from the same era. The detail does emphasise the more primitive nature of Klingon exterior ship design in the 22nd Century; even the underside is perfected again due to that 99% metal construction. Eaglemoss have coated the hull with an unusual mottled paint effect which works very well with the radiator and venting points raised and emphasised in shades of red which are a little akin to the later Vor'Cha Class rather than the D-7s of The Original Series. Might have benefitted from some of those red transparent pieces in either the warp or impulse engine exhausts. The finish overall on this one, more than likely due to the minimal plastic-work is "A" grade and makes you wonder just why we never saw the Somraw design in other episodes. With the rear-fixing stand this is an unexpectedly nice piece and one many fans are more than likely to have forgotten. I know I keep saying it but the hull plating and markings on these Enterprise series CGI models is still a step above a lot of the recreations based on physical models used for filming. Each panel is etched with precision and the plan views are a nigh on perfect match to the ship in the box. I think what really does make this stand out is that thin cable surface detail, the weapon turret and the little marks that bring out the lines of the Raptor. Equally it's the use of space within the structure which add to the impressive overall effect. If you had forgotten then the magazine is going to be a godsend, acting as an enhanced episode guide to Sleeping Dogs from Enterprise. The usual entrance text rolls back the episode synopsis while interlacing detail on the layout of the Raptor followed by discussion around the writing of the episode itself which brings the whole piece together. In fact by dropping in the design story of this Klingon ship, issue 41 is a comprehensive snapshot of one episode from the first season of the prequel show. 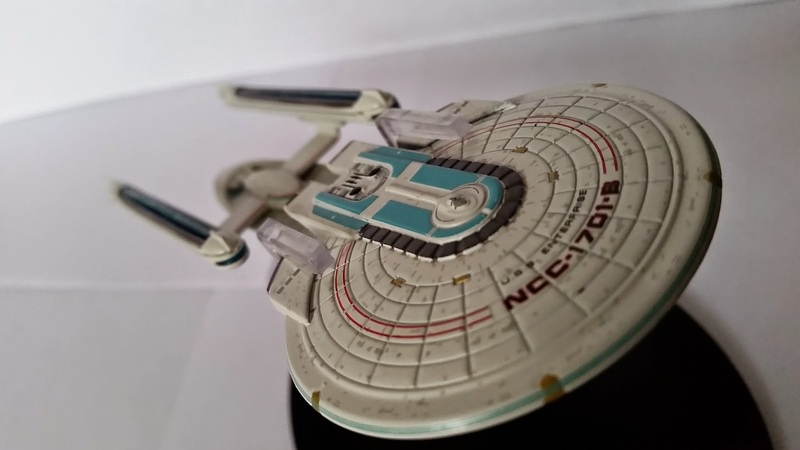 This was a good move on the part of Eaglemoss and could indicate the next step forward as we start to see more and more "one-off" ships from the franchise which don't have a great deal of information on them. In some ways I wish that the Enterprise-B issue had focused more on the Kirk-era scenes and tacked the same line rather than diving off into the Picard-era saucer crash sequence. Of the two magazines, the one accompanying the Raptor is easily the better and more logically written. 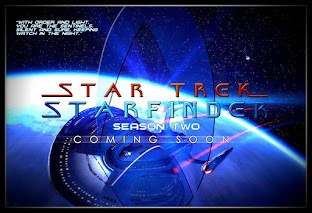 Next month we've got the USS Pasteur from All Good Things... and the 8472 Bioship from Voyager's Scorpion. Two classic designs and unusually not one from Enterprise! 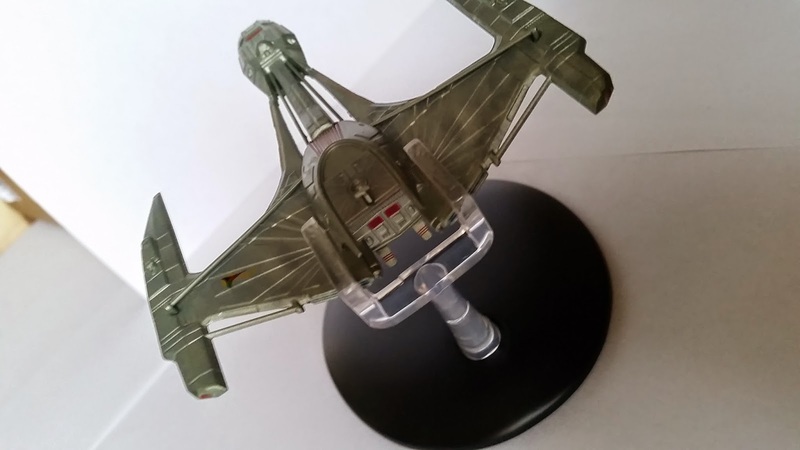 What did you think to the latest additions from Eaglemoss? Let us know below! 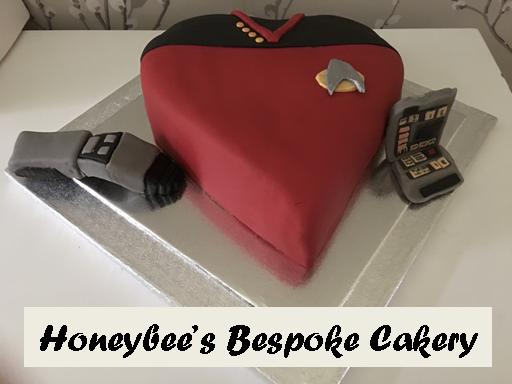 Last time we covered off my purchases to enhance Starfleet and this time it's the turn of the Klingons and Romulans to get a bit of the limelight. 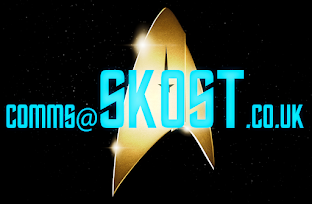 I'm Starfleet through and through, stashing a bit aside for the Equinox and the upcoming Prometheus but what's the fleet without something to head off against? Also it means my dad is happy since his alliance of choice, the Klingons, have gained two ships. But first, the Romulans. She's a predator. That was according to Jean-Luc Picard in Nemesis and cracking open the expansion pack you can hardly disagree when you take a look at the Scimitar. Aside from the high SP score for the ship alone, it's rammed with some killer features that make other ships pale in comparison. I think I'd be worried if I was going up against it with a couple of smaller ships and I'd doubt the Enterprise-E would survive in a head-to-head. The miniature itself is one of the best. I didn't get it for the ship but the detail given the scale is fairly good and shows up how poorly presented some of the ships from the earlier waves were (Voyager and Defiant step forward please). Colour scheme is good and the all round markings are very distinct so top marks to WizKids for this one. Already I've faced off against this formidable opponent in a three-way transgression with Voyager and the Negh'Var. 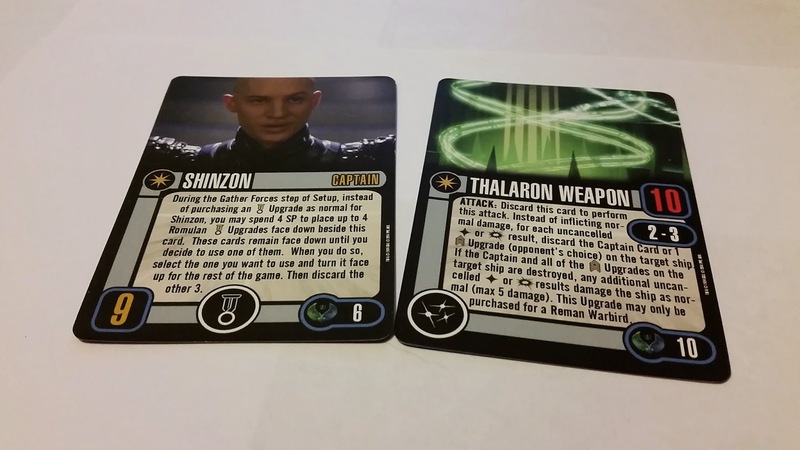 Put it this way, if you get in the way of the one-off-use Thalaron Weapon you're in for a bad game since it can wipe out a good portion of your shields and hull in it's one hit which requires ten attack dice (note to self buy another set). But is that all it can do? Not at all. Aside from the standard expectations of a cloaking device, sensor echo, evasive maneuvers and target lock, the Scimitar also comes complete with Shinzon for captain which effectively gives you free reign over your choice of Elite Action. 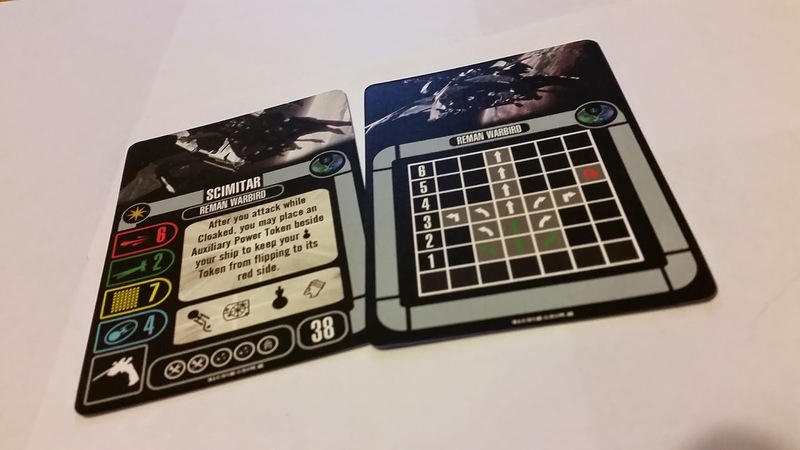 This captain card only adds to prove that everything about the Reman warship is BIG and deadly. Improved cloak is another killer move allowing you to go invisible whether or not you have active shields or any auxiliary power tokens and it's evident that there are quite a few which are only applicable to this massive warship. In fact for most of the game I played against her I spent it running cloaked trying to find a way to take out Voyager first. And did we mention it's stupidly high hull points or the secondary shields? Probably not but if you want to last a while it's a good ship to go for. 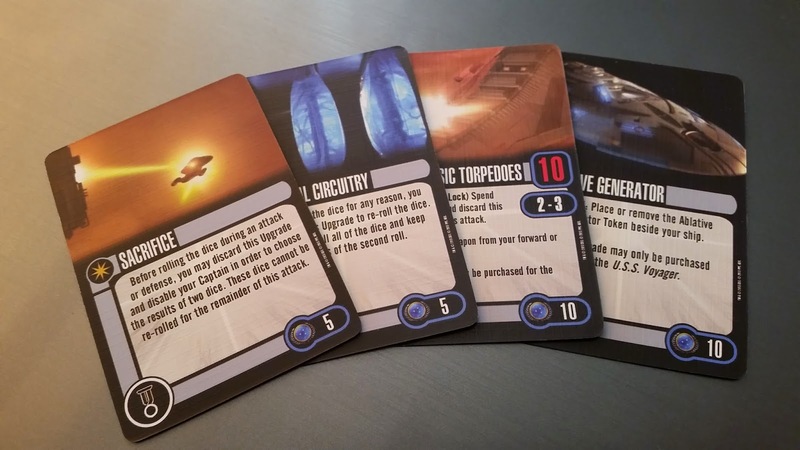 Only concern I would have is that you'll get slapped with a lot of critical damage cards to deal with in the later stages of the game but then that's the payoff for choosing one of the more powerful vessels available outside of the Borg Collective. You also do give up some maneuverability with having the larger ship which is one of the drawbacks of using the Klingon flagship, the Negh'Var too. In the three-way dogfight Voyager easily outmatched the other two for pace proving to be a rather slippery target to hold down. On the flip side of that though the Klingon flagship is a bit of an enigma. It's definitely middle-of-the-road material with pretty impressive primary attack power and a decent hull score but gets let down by its lack of upgrade spaces, maneuverability and shield strength. 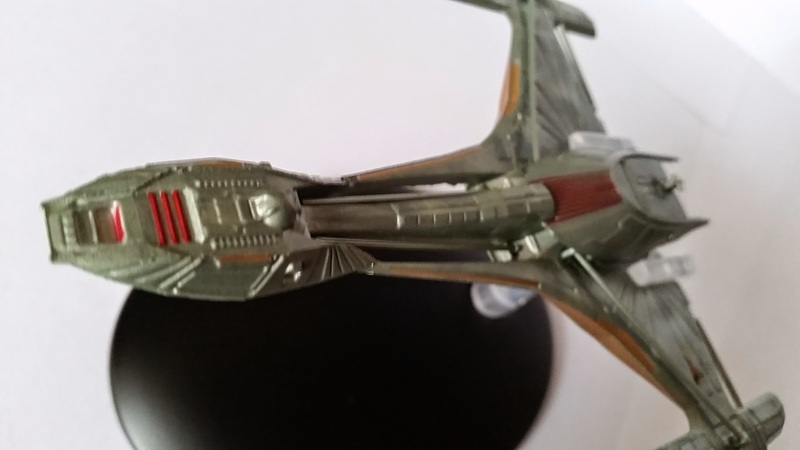 In fact lining her up against the Vor'Cha cruiser from the Starter Set there's one single point difference between the two and that's on hull integrity. Playing as a single ship does mean that the captain cards of Gowron and Martok are fairly pointless giving their leaning to assist other ships in your fleet (Martok does specify "friendly" rather than "Klingon" which might be key in battle) so you might end up picking a commander from another faction ship if it's a one-on-one situation. 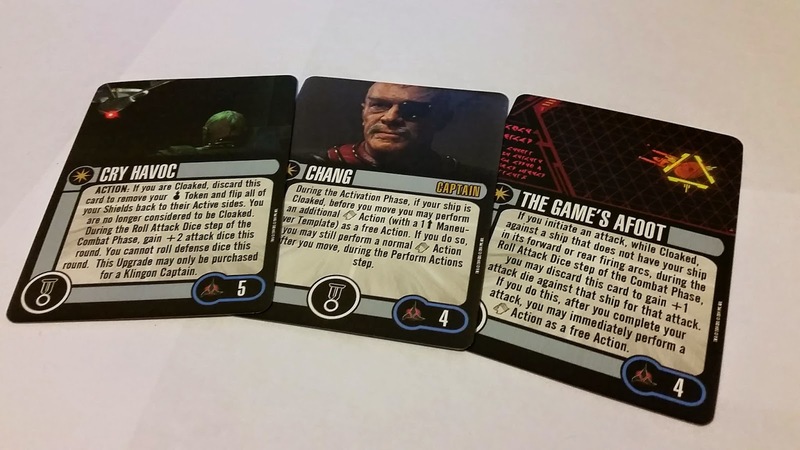 I did pick Martok purely to use the Elite Action option but would think again next time. I do like using the Negh'Var with the photon torpedo advantage card but that's not an exclusive to this ship as many ships do have that feature although not always rear-firing however once you're in the middle of a firefight there's not much room to escape unless you're timing cloaks and sensor echoes to perfection. Which leads nicely into my third ship acquisition, Chang's Bird of Prey. I had promised myself I would stay true to the later The Next Generation and beyond timeline but when your dad's a massive fan of the Klingons and you want to ensure you have a worthy opponent in battle you have to make some concessions and this was mine. 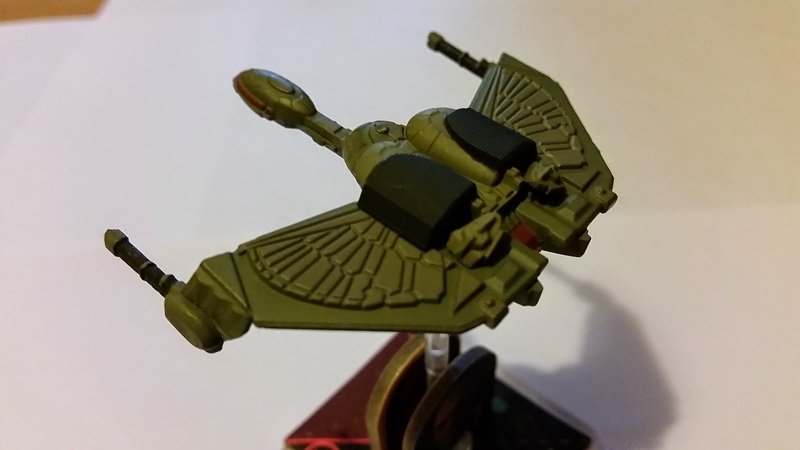 This Bird-of-Prey came out in the same wave as the Scimitar we've already mentioned and in line with that ship the hull detail is decent (but not quite as good) with the wings down in the flight position. For note the previous Bird-of-Prey release had the wings in the lowered attack configuration and was a specific ship class. Here with Chang's prototype we simply have it listed as the Bird-of-Prey rather than B'rel or K'Vort. One of the big draws here for me as a player/collector was the Chang card which lets you add in an extra sensor echo during maneuvering. Oddly it also comes with Gorkon (potential Fleet Admiral there) and Brigadier Kerla as your alternate captains. I suppose there weren't a lot of options between this one and Kronos One which was released earlier in the series. 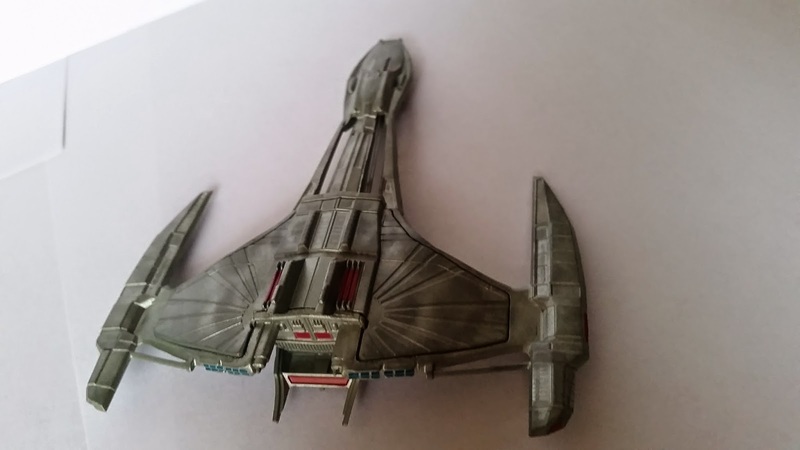 Notably against the Negh'Var it comes with many more ship-specific features and nuances only adding to a level of disappointment with the Klingon's flagship from Deep Space Nine. For my dad though the selling point of Chang's ship was indeed one of those game-changing features - the ability to fire while cloaked. Now if I'd used this instead of the Negh'Var I think it would have helped push the advantage my way and given me more to do than duck and cover for most of the encounter (damn you Scimitar) however given that the trade off is the ship's main stats vs this one unique selling point you would have to verge towards the Klingon flagship. 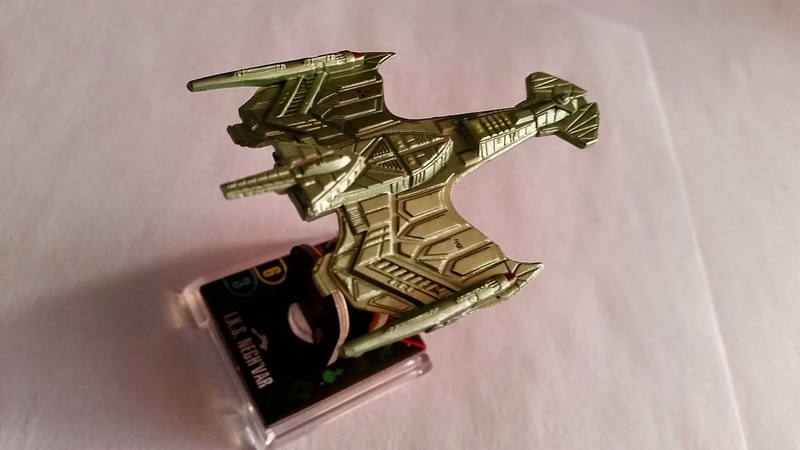 If you were points limited to smaller ships then I'd probably plump for this one to take on a Romulan scout or the Defiant for example (three-way cloaking!) but against the bigger ships there wouldn't be that much hope for success. 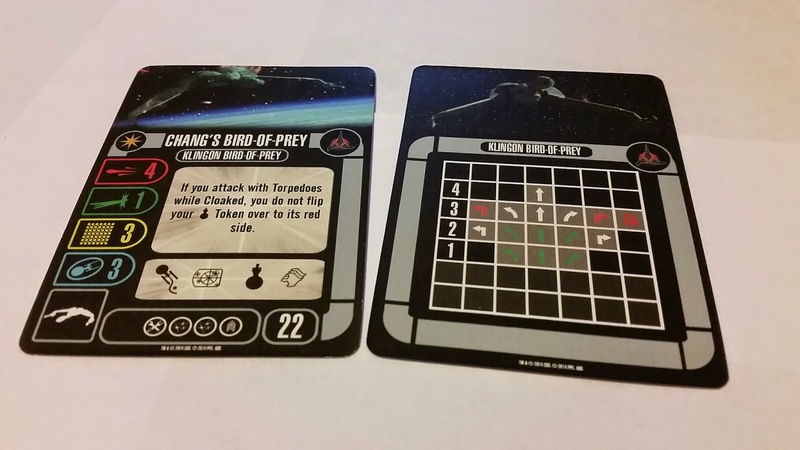 The Bird-of-Prey also benefits from some superb Elite Actions in Cry Havoc which links attacks and cloak while The Game's Afoot takes advantage of firing and moving making this small ship a dangerous beast to tackle. Looking forward to putting her up against the Defiant which I've recently acquired from across the pond. Also these three give you the chance to get into the Star Trek universe with their packaged scenarios. The Scimitar returns us to the end of Nemesis with the warbird taking on a Starfleet ship and a Romulan ally while the Negh'Var has Klingons vs the Federation to Destroy the Space Station in a revisit of The Way of the Warrior. Finally Chang's Bird-of-Prey replays the two on one hunt that closed Star Trek VI. All three are classic scenarios but playing them without the correct ships is sure to bug players who have chosen not to buy every ship every month. Sad to say but another one player story wouldn't go amiss for those of us who can't get a regular two player fix or able to get to any of the events. 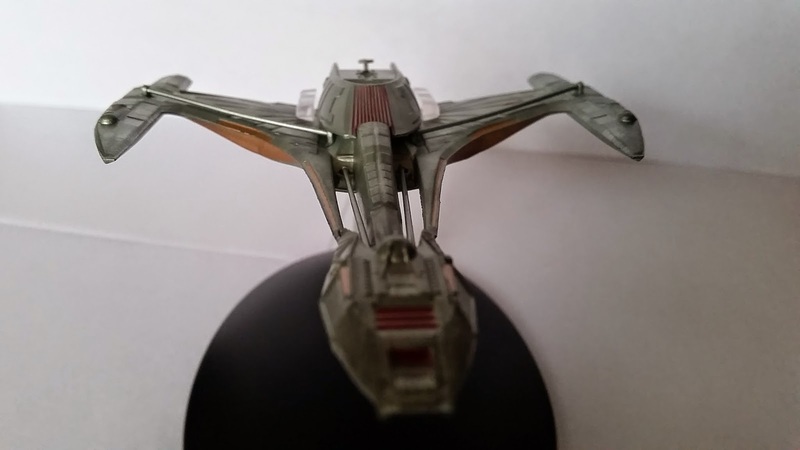 The Bird-of-Prey and the Scimitar easily outclass the Negh'Var on their features and specs making them valuable in any fleet but they do show up just how average the Klingon flagship is and the potential it's missing. 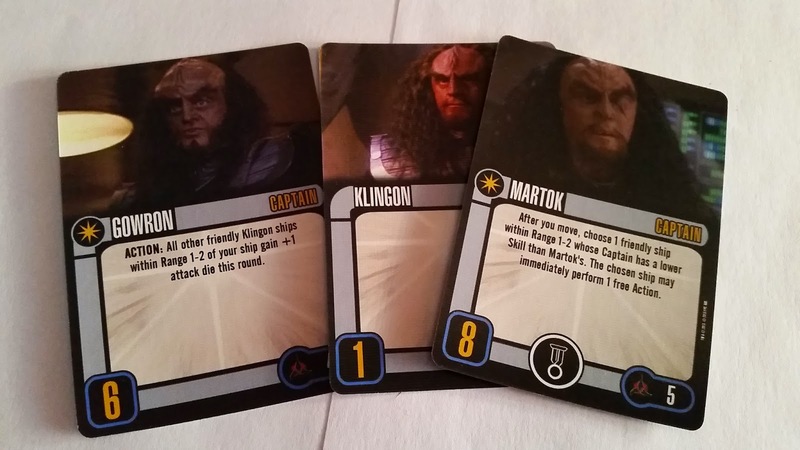 OK so it didn't have a lot to do in it's limited appearances but I would have hoped for more than just picking up the surprisingly average Gowron and Martok cards. I guess from the fact this is from the earlier waves it's also why neither of these two managed to make it as Fleet Admirals. I still have to get to grips with this new slice of the game and will update on my experiences shortly. Any recommendations to add to my fleet? What's your preferred non-Federation starship in Attack Wing? Why not let us know below! Ever since their introduction in Deep Space Nine's Inquisition, Section 31 have been one of the most intriguing arrivals into the franchise, popping up again in Enterprise and also revealed as the builders (among other things) of the USS Vengeance in Star Trek into Darkness. The evolution of the Deep Space Nine story in the novel series is one factor that has drawn me back to the literary Star Trek world after a serious length of absence. A lot has happened but the turn of events in the recent five book series pushed a very big button which seemed to draw a line under a lot of things but at the same time marked a jump off point for virtually every major character in the franchise who is alive in the post-Nemesis galaxy. Bashir's story for one was left hanging. 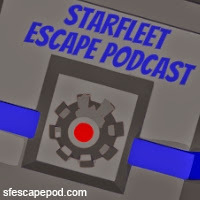 Spat out of Starfleet following his actions to save the Andorian people, hunted and imprisoned, he's now free and without a blemish on his record. Trouble is that there are others with designs on his future and it goes by the name of Section 31. 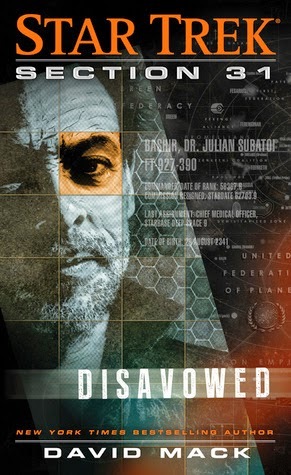 Disavowed is a far cry from what I expected. I thought we were going to be in for a straight spy story with Bashir in some form of deep cover a while after The Fall however I couldn't be further from the truth. As the galaxy (still) recovers from the devastating Borg attacks chronicled in Destiny, events are moving along both in this universe and the mirror one with some parties hoping to expand their influence into other realms. Bashir himself does display some of that smug, genetic brilliance at points throughout Disavowed but it never seems to grate. It's provided just in the right amounts and I did feel that I could connect to him, moreso in the later chapters and events. The first 100 pages give the impression we're heading into that aforementioned spy territory however when we get the inclusion of the Mirror Universe it all takes a rather unexpected twist and one which ramps the book up in my estimations. Frankly, if Resurrection and The Emperor's New Cloak had managed to provide this kind of entertainment level then we'd have been in safe hands - David Mack you should've written for TV Star Trek. This novel makes you think about the whole wormhole piece that was never explored onscreen in the Mirror Universe stories. What exactly was across the other side? Who was there? Well, precisely who you would expect is the answer; the Dominion. The interesting bit here is that the Dominion of the Mirror Universe is very much like the Dominion of the regular universe which kind of makes sense. 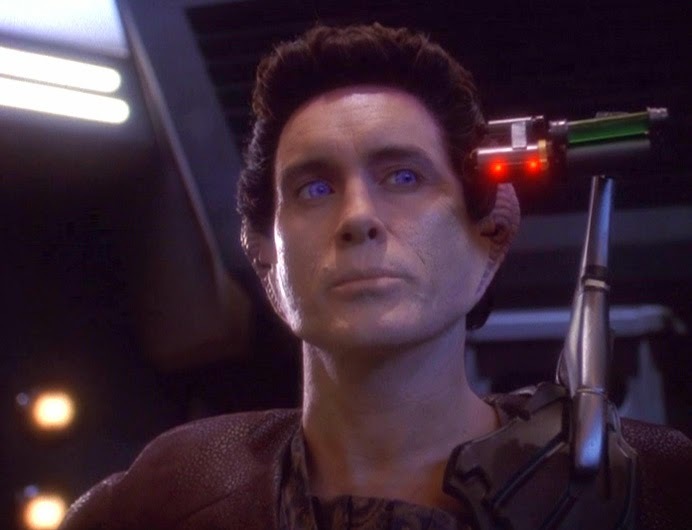 The Founder acts with the authority, presence and don't give a s**t that became her hallmark in Deep Space Nine while the Weyoun we have here is just as slippery and ever-present to pass his opinion. Mack has truly got his cast down-pat perfect - and for those who wondered where Eris vanished to after The Jem'Hadar, we do get to see her again here and with the nod to those telekinetic powers that disappeared with her. We could kill some paragraphs talking about the grittiness of the alternative universe, the dark tones etc etc but that's what you would expect and Mack delivers in dumper truck loads. What is especially cool in Disavowed is the arrival of one Jean-Luc Picard captaining the jaunt ship Enterprise with his first officer K'Ehleyr and tactical officer Deanna Troi. 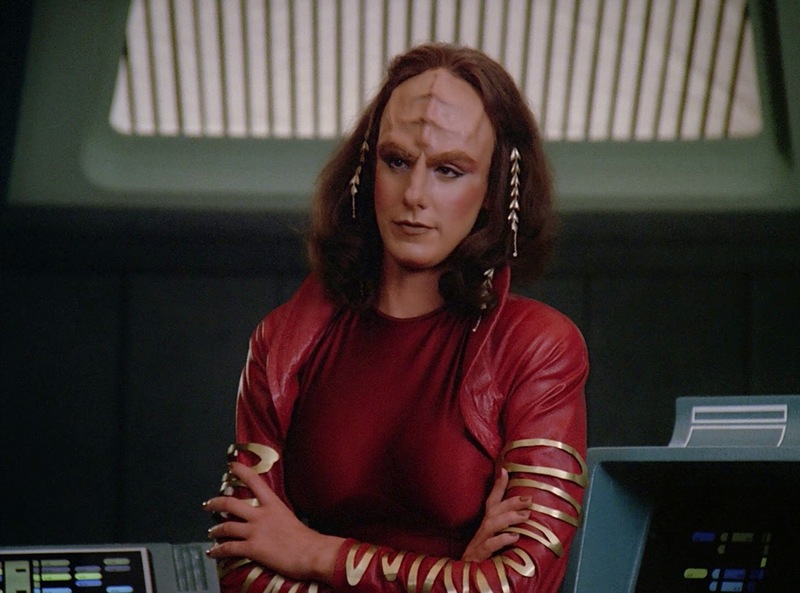 I didn't expect Worf's ex to be in this story however a fiesty female Klingon is always worth a serious amount of page inches and the character played by Suzie Plakson in The Next Generation is just about edgy enough for me. Her inclusion is a brilliant curve ball that I would never have considered but gives Picard that other opinion he so often belayed with Worf in the Prime Universe(!). Stepping back from the story this could have easily been any set of characters but involving the "ignored" The Next Generation characters is a solid gold step that Deep Space Nine made oh so more obvious by including Mirror Tuvok in Through the Looking Glass. Clearly not a commercial for Voyager in any way. At all. Honest. The Section 31 squad which Bashir becomes involved with here do tend to disappear into the background once the novel hits it's tipping point around Bashir and his first visit to the universe in Crossover. One particular action that occurred then has caught the attention of the Dominion which then cascades into the negotiations between the Gamma Quadrant power and the fledgling Commonwealth of the Alpha Quadrant overseen by a certain Michael Eddington and his counsellor, Saavik. Picard is Picard is Picard and even the mirror version is the seasoned negotiator as well as a freedom fighter. His relationship with Troi is certainly misty here; friends certainly but maybe more if you read between the lines or was I just thinking a little more than I should have been? Troi is more headstrong and there's more than a little irony that Marina Sirtis originally auditioned for the role of tactical officer for The Next Generation - she finally made it but only on paper! Mack hasn't fallen into the usual Mirror Universe trend of suddenly making every well-known Prime character appear as an alternative version of themselves. 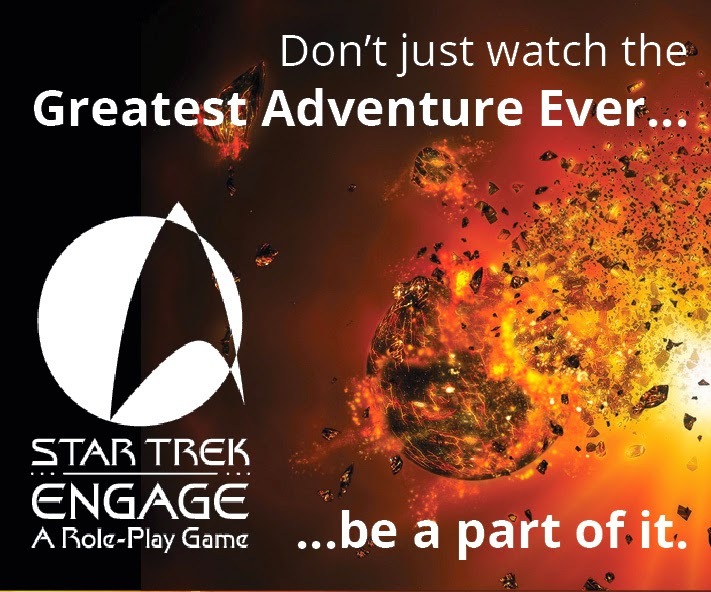 You half expect Riker, Geordi and Beverley at the least to all appear and have a cameo performance but we manage to steer clear of that overplayed cliche (Vic Fontaine in The Emperor's New Cloak anyone?!) and tread carefully through to focus only on the necessary ensemble. There's no baggage here and that's a big payoff for the reader. Everything is just so, ordered, necessary for the story. Indeed, Disavowed successfully stays away from turning into an action/adventure novel for the most part and focuses more on the political machinations between the Dominion and their potential allies in the form of the Commonwealth. It's a clever little "what if" position with the Alpha Quadrant on the back foot from the off however there's an ace in the sleeve which made me re-read an entire section of the book to make sure I hadn't missed it. I can assure you that I hadn't and it's also one of those points I've wondered about for years - whatever happened to.....? Mack has produced a unique, different and thoroughly engaging novel in this Section 31 entry. It's like nothing else we've seen for some time and while taking us in an unexpected direction it's brilliantly continued the story we've only recently completed in The Fall. I can absolutely recommend this to any fan out there. For some the continuity might be an issue when you realise Bashir is no longer in Starfleet and he's dating the Sarina Douglas formerly of the "Jack Pack" from Statistical Probabilities but don't let that put you off. The worst thing that can happen is that you're going to be investing in a lot of older Star Trek novels just to keep you up to date. Personally I'm already chomping at the bit for the next installment of this expanded universe saga. What did you think to the novel? Was it better or worse than expected? Do you think this universe expansion has enough legs? Let us know below! As you will recall from my first piece on the universe of Attack Wing I not only purchased the all-conquering Starter Pack but also the expansion pack featuring USS Voyager. Definitely an apt pack to have kicked off my collection with seeing as this week marks the 20th anniversary of the franchise misplacing the Intrepid Class ship. 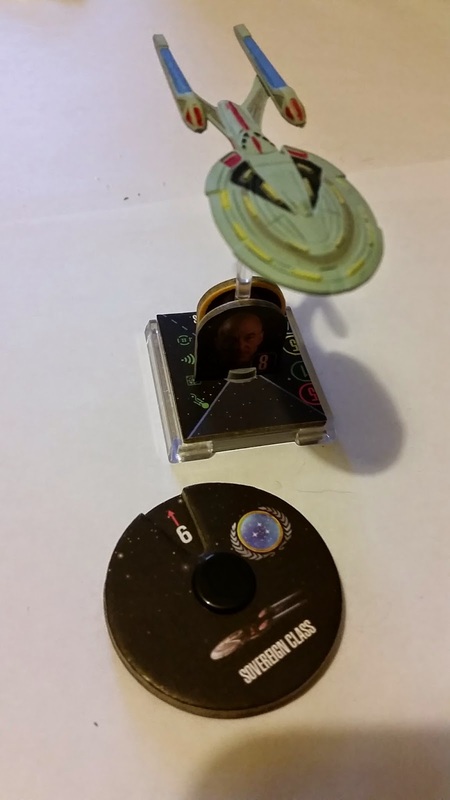 And not to peak too early I decided to hold back and look at the Voyager expansion as a separate article from that original post on the starter set in December. After all, for the amount of stuff you get in the pack you need a breather just to take it all in. Which turned out to be a good decision as I chose to invest in a few more ships in order to win at least one game. That means that we'll also be talking about the Wave Eight USS Enterprise NCC-1701-E.
First though, the smaller of the two. There are two big points as to why Voyager has to be a part of your collection and ultimately your fleet. First off its the upgrades; both the ablative armour and transphasic torpedoes are available for exclusive use with the ship and offer some much welcomed defensive and offensive capabilities. 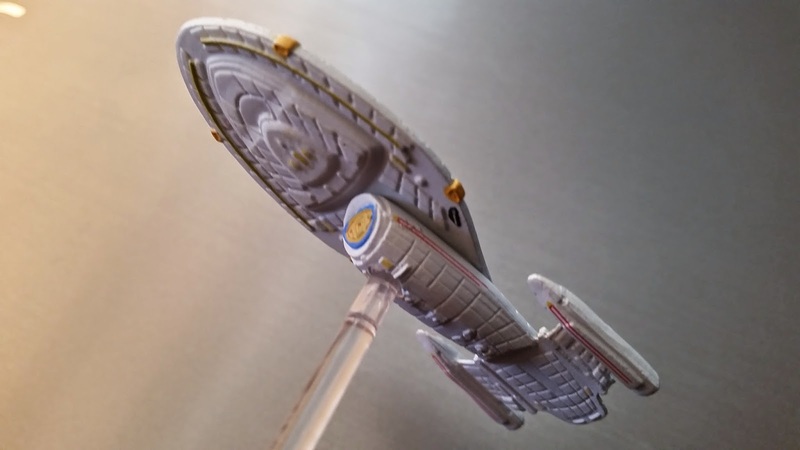 That's not to say that Voyager is any less of an asset than the Galaxy Class which graced the starter set but these two abilities do put more substance into the expansion as well as reflecting, fairly accurately, the enhancements that the ship gained during its time in the Delta Quadrant. There are also the Sacrifice elite talent, bio-neural circuitry and photon torpedoes which can be equipped on both Voyager and other vessels in your fleet. The second key factor here is the one player bonus mission, Endgame, which is included in the pack. For me getting an opponent at the drop of a hat isn't possible and while I can wait for my dad to drop round, there are times when you just want to test out some tactics and, y'know, kick the Borg's posterior. With this mission you can as it places you into conflict with three Borg Cubes and a Sphere as you attempt to destroy the Borg conduits. Sounds easy? It isn't and on the first couple of attempts I got utterly pasted by the Borg.... Seems like a recurring theme for me this defeat.... But you start thinking more about ways to avoid the worst of the conflict and how your super-duper upgrades can help you achieve the mission goal. For the record on this one I'm still trying to work out ways of making it past the Borg wall without getting obliterated, ablative armour or not. Ok, let's talk about the ship herself. As with the other ship models, don't expect top drawer detail on the Intrepid Class vessel. Functional it is, display worthy it isn't. However it's stats do stand up against even the flagship standards of the Enterprise-D with only slight variances on shields. Notably she can run faster although there isn't the option for a full about which has come in handy a few times with the Enterprise. Add to that the absence of any red turns, even the hard right and left, and you can start to see the advantages. Lining the D up against Voyager their primary weapon level is the same and their combined shield and Hull score is also identical but Voyager rolls an extra die in defence. Certainly this is your tradeoff for that reduced maneuverability. 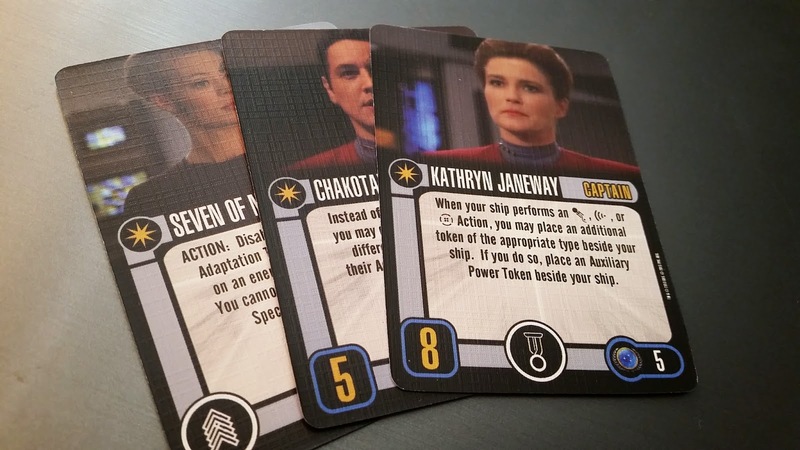 Fans and players will be emphatic that there's no Neelix card in here - so no option to disable the cheese as your chosen action but we do get two captain options with Janeway and Chakotay with crew upgrades from Paris, The Doctor, Torres, Kim, Tuvok and Seven of Nine. Of those, Seven and B'Elanna seem the most valuable, providing you with more upgrade slots and also causing some issues for your opponents but they might end up being used down the line after you've exhausted the benefits of your Enterprise crews. Voyager was my opening impulse purchase and after Christmas it was joined by the Sovereign Class Enterprise-E among others that we'll come to in a later edition. Model-wise it's not the best, at all. Very basic paint job, quite blocky and mine had a slightly wonky port nacelle however feature-wise she's loaded to the shuttlebay with some very, very useful upgrades. Oh, and the fact she sat slightly sideways on the pole as you can see here. There's a full range of movement for the model (except a 180 degree spin) but you do get a reverse maneuver which has been key a couple of times to avoid a nasty phaser attack. The stats also show she's +1 on Hull, Shields and Primary weapon over the Galaxy Class and sacrifices -2 reverse for more flexibility in movement and less requirement to use auxiliary power. The movie Picard has a slightly lower skill rating however his ability to give you an extra damage result certainly will assist on the front line. 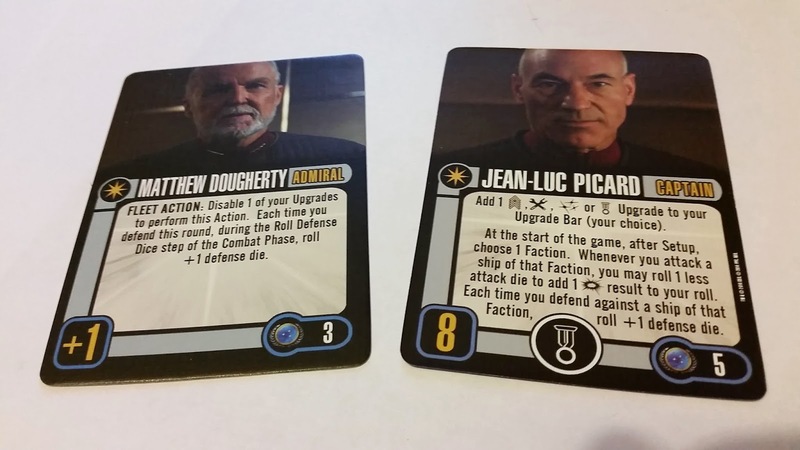 Admiral Heyes is the "generic" captain for the pack and Matthew Dougherty from Insurrection can be flipped either as your captain or Fleet Admiral. This is my first experience with an admiral pack (although I do want to grab the movie Enterprise/Kirk pack asap) and his action, allowing an extra defence die can come into play either across the fleet or just on his assigned vessel. Pretty useful especially with my abysmal track record but more on that as my experience blossoms. Rounding out the crew of the E are Data, Geordi, Troi, Crusher and Riker (not a captain as per the D) with the two ladies replacing Worf and O'Brien. 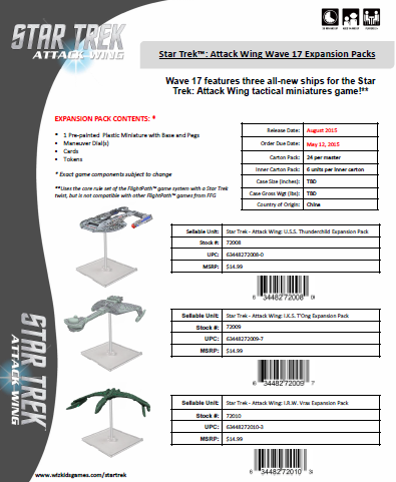 Your two weapon slots might well get one of three options - quantum torpedoes, photon torpedoes or the dorsal phaser array which do offer excellent tactical advantages as do the crew choices but can you have two Enterprise's on the same team when the rules specifically say you can't have crew with duplicate names as part of your faction. If that's the case then you're left with few options if you're points limiting. That said, the D and the E use a hefty amount of points just on the ship let alone adding any upgrades to pack that extra bit of firepower. In that case I then looked to use Voyager as that third ship to provide some needed upgrade point space but it still clocks in at 30. Mind, a Borg Tactical Cube clocks in at 46 so think yourself lucky. This leads me to the conclusion that a ship in the low 20's to help out which would lead me to the Defiant, Equinox, classic or refit Enterprise or the Reliant. 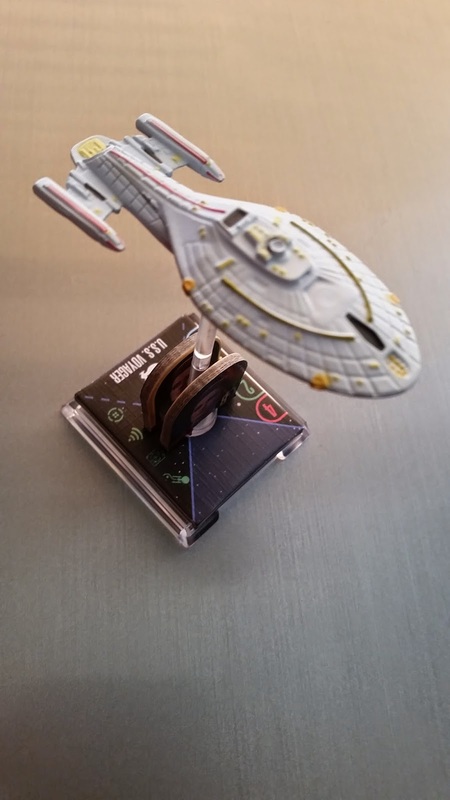 These two have been great additions alongside the Enterprise-D in battle but having something a little nippier and smaller would be a godsend at times. Hunting some of those down after Christmas is turning into a bit of a mission and Wizkids aren't exactly forthcoming with precise information when you finally manage to get in contact with them. Is there a better one of the two? Maybe I would lean on Voyager more due to the ablative armour and transphasic torpedoes but after a few more plays I'm confident the Sovereign Class Enterprise will be a fitting flagship for the fleet. Have you started a fleet and how are you finding it? What's your combat preferences and do you have any good tips? Note them down and let's talk business!